Distribution Originated from the Yamato River in Japan. Sexual Dimorphism Females usually larger and more deeper-bodied than males. Females also have a distinctive brood chamber on the abdomen. 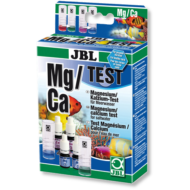 Water Parameters Will acclimatise to a wide range of aquarium conditions. pH: 6-8, dH: 6-18 degrees. Amano Shrimp were introduced to the aquatics trade during the 1980's by planted aquaria guru Takashi Amano, when he noticed this species excellent algae eating capabilities. 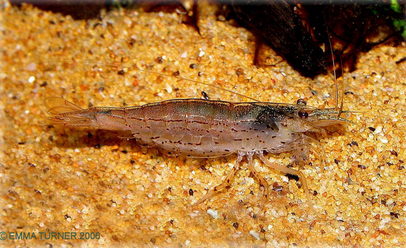 Must be kept in groups as Amano Shrimp live in large social colonies in the wild. Will stay hidden a lot of the time and will enjoy browsing on various types of algae (including hair algae) that have formed on plants and decor. Do not keep with any large or aggressive fish species as they will become an expensive meal. As with all shrimp species, acclimatisation must be carried out slowly and carefully. If ever you need to medicate an aquarium containing Amano Shrimp, please check with the manufacturer that the intended medication is safe with shrimp, as not all are. Amano Shrimps will moult regularly whilst growing, and the sudden appearance of perfectly formed shrimp casings on the floor of the aquarium can cause alarm to fishkeepers who have not seen this before. Once the shrimp has moulted, it will remain hidden for a time until the new shell hardens and it has a bit more protection. Often also seen on sale as Amano Plant Shrimp or Japonica Shrimp. Aside from algae eating, this species will appreciate most foods that are added to the aquarium - often darting out to grab a piece and returning to a secluded area to pick at it. 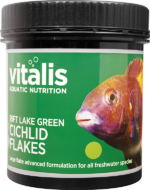 Include small pellet foods and algae wafers. Tricky and many different opinions abound. The female incubates up to 2000 eggs for 6 weeks, after which time tiny larvae (not tiny shrimps) are released. These must be immediately and carefully transferred to brackish water and fed miniscule foods such as Liquifry. During a 4 week period, they will moult several times and gradually develop into young shrimps. They must then be carefully and slowly acclimatised back to fresh water. The adults will not survive in brackish water for any length of time, so a separate breeding 'transfer' tank must be available to you.